Mixing and mastering your music takes critical listening on multiple monitoring sources. But how do you control and easily switch between your monitors? 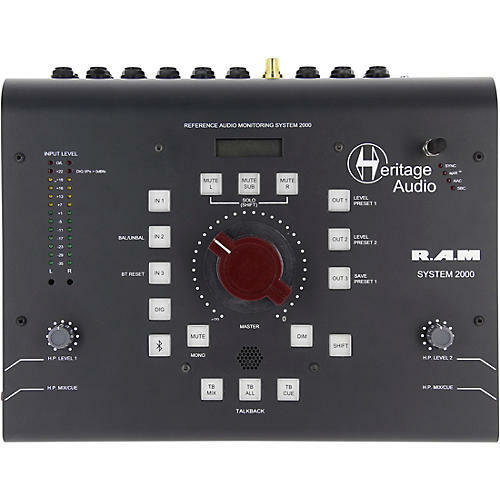 Enter Heritage Audio R.A.M. System 2000. The R.A.M System 2000 is a mastering-grade controller for your studio's multiple monitors. It has 3 pairs of balanced analog inputs, 3 pairs of outputs and a high-quality Bluetooth input. With its classic looks and massive red rotary dial, you'll easily be able to dial in 64 steps of volume attenuation to ensure your playback is perfect to craft your best mixes. Desktop format with classic look. All functions on high quality illuminated engraved buttons. 3 pairs of balanced +4 analog inputs ( input 3 unbalanced -10 configurable). Independent CUE input, for making specific cue mixes to musicians. Burr Brown 24 bit / 92 kHz DAC INPUT on SPDIF connector. Bluetooth pro audio quality INPUT for easy mobile device integration.